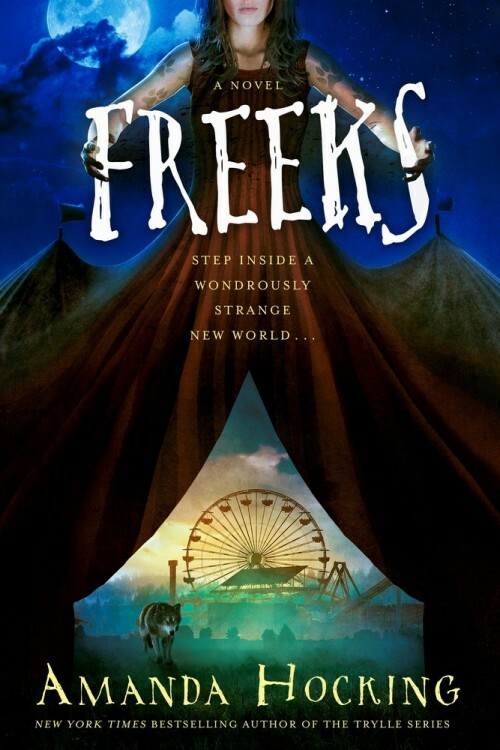 –Freeks is a stand-alone novel, meaning it starts and finishes in a single book with no sequels or prequels or anything. –Freeks will be out January 3, 2017 in hardcover and ebook. –The soundtrack for Freeks (which is the playlist I created to listen to while writing the book) is my absolute favorite of all time. I’ll post another blog about it in the future going more in depth, but for now, you can check it out: here. The idea for the book was actually solidified while listening to “Hush” by the Limousines. For those of you who want more background on Freeks, it is totally my baby. I started writing it several years ago, actually, before I wrote the Kanin Chronicles. It was after the Watersong series had started coming out, and that series didn’t do as well as I’d hoped, and I’d been obsessing over the whole publishing industry and so focused on the business side of writing I’d really lost sight of actually enjoying the process. So I sat back and I said to myself, “What do you want to write about? Who cares if people read it or it’s good or anything? What interests you?” So that’s how Freeks started, with me writing a book just for myself filled with things I love, which is how the book ended up set in 1987. The number one inspiration for the book (aside from Pretty in Pink and The Lost Boys) were old pulpy horror novels I used to get at rummage sales when I was a kid, along with V. C. Andrews and Stephen King (to name a few). I ended up stepping back from Freeks for awhile to work on the Kanin Chronicles, but when I went back to it, I loved it just as much as I had before. To this date, it’s my favorite thing I’ve ever ever written (and I think it will be for a long time to come). It was a whole lot of fun, and I really found writing a stand alone to be very freeing – I didn’t have to worry about holding back or what to put in or save for the next book. It’s all there. So, anyway, I couldn’t be more excited for Freeks to spring forth into the world. I genuinely really and truly love this book, and I think many of you will, too. I am absolutely shocked when you mention that the Watersong series did not do as well as you had hoped. I just finished reading them and I LOVE your writing. You had me as soon as I read the first Trylle book several years ago. I am so excited for this new book. I am about to begin Virtue, and I cannot tell you how excited I am. Please keep doing what you are doing…making GREAT stories for people to fall in love with. Are you doing arcs for reviews? I am so excited, January can’t get here fast enough! I love all your books(Watersong my all time fave) and can’t wait to read the book you most enjoyed writing! Gonna wet myself with excitement. Problem is I have to wait another 5 months till it come out:( ah well. I have yet to read “the hollows” series so I’ll read that for now. Love the cover! This book needs to be out already. Oh well, another reason to anticipate 2017. Amazing cover by the way. The design is epic. I love the fact that you enjoyed writing this book so much. I’m looking forward to reading it for that reason. I’m so excited for this book! The cover is making me drool!